After a year rebuilding, and 20 years as a static museum display, N&W 611 stormed back into steam, and the public's mind, in 2015. Crowds turned out to watch the J Class 4-8-4 as she took up the Queen of Steam mantle once again. Built by the N&W in Roanoke, the J Class was destined for greatness. In this program, we'll see 611 and several of her sisters in 1950s historical footage. We'll see 611 pulling the Powhatan Arrow. We'll see her on her side and look at the wreck that probably saved her for later generation to marvel at and ride behind. And we'll see 611 on excursion duty in 2015. This is a look at 70 years of N&W 611 history. This program is licensed by the Virginia Museum of Transportation, owner of the 611. A portion of sales will be paid as a royalty to VMT and will go directly into the 611 Endowment Fund. 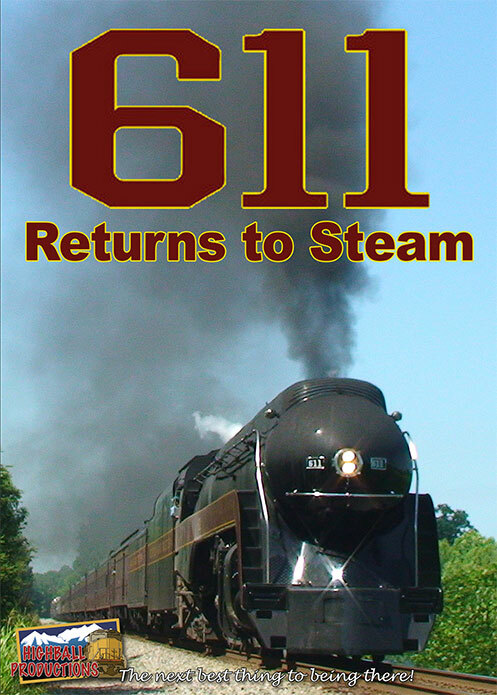 YOUR PURCHASE HELPS KEEP 611 IN STEAM! Run time: 1 hour, 2 minutes. Copyright 2015 by Highball Productions. Cover photo by Ron Loving. Gary Jacobs (Hendersonville, NC) on 2015-08-06 18:40:13. HIGHBALL is the producer, and that's what 611 does in this program! Narration is minimal, but informative, as are the on-screen displays. 611 does most of the "talking", but the natural sound-people shouting, dogs barking, etc makes the presentation more true to life. There is no coverage here of the rebuild, only the results of the efforts and $ of many, including NS 1.5 million in support of the project. Corporate will is evident. Well done, reasonably price, worth having. rrvideojunkie (USA) on 2015-08-25 16:48:34. A terrific program about the mighty 611. Lots of great runbys and great stack talk. Love the historical footage of this locomotive. The wreck scenes were stunning and bittersweet as it likely did save the 611 from scrappers. Only gripe about the program is that the narrator said the NS discontinued the 611 runs in 1993. It was actually 1994. That would have been one super hallucination I had watching the 611 in action for the Roanoke Railfest excursions in 1994. I agree with you. 611 made special trips during 1994. Like doubleheading with Frisco 1522. sorry mr. narrator, you are wrong on 611's second retirement. Everywhere West on 2015-08-10 01:50:54. 611 puts on quite a show here. She's full of speed, smoke and stack talk. If you squint you can almost see her pulling the Powhatan Arrow in the 1950s... except you don't even have to squint because this DVD has actually footage of 611 doing exactly that in the 1950s! The film of the 1956 wreck was interesting too. I also appreciated the extra video of the other J Class locomotives. That was a nice touch.